It’s time for another open cluster, and in truth I’ve built myself a bit of a backlog. The issue is that I’m too lazy to scan my drawings in a timely fashion. That’s my excuse and I’m sticking to it. 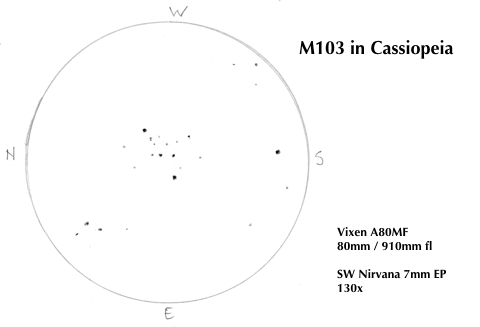 This time I’ve chosen to turn my telescope, with pencil in hand, on M103 (one of Charles Messier’s objects) in the constellation of Cassiopeia for the second time this season. The first was with my ST-80, but I felt that 44x magnification didn’t to it justice. So on the night of 4/5 October I returned with the Vixen A80MF and 7mm Nirvana eye piece for a higher powered attempt (130x). If you know what you’re looking for M103 isn’t hard to find being about 1 degree from the 2.5 magnitude star, delta Cassiopeiae. It’s not one of the “obvious” clusters, in fact I’m not sure why Messier found this one and not the nearby NGC 663, perhaps it looks more “cometary”. So once again, here’s a scan from my logbook. I’ve tidied up the notes on the computer, but the sketch has just had the contrast increased as the scanner leaves it a bit faint. My field of view is about 38 arcminutes with this telescope and eye piece combination. You’ll get to see the scan with handmade notes if you click on the sketch. And this is what the Deep-Sky Survey makes of M103. I don’t think I’ve done too badly. To my eye, and telescope, M103 isn’t rich with stars. I’ve drawn pretty much all I could see, and some of those weren’t constantly visible. Yet there weren’t many more than a dozen stars in the cluster. So I classed this cluster as p (poor) using the Trumpler system. There aren’t any really bright stars in M103, but there are obviously very faint ones (I estimate that I could see down to about 11.3 magnitude). This led me to settle on a brightness range of 2. This cluster is clearly detached from the Milky Way background – quite a feat that was contested for some time after it’s discovery – and there’s concentration of the brightest stars, but its not highly condensed to my inexperienced eye. 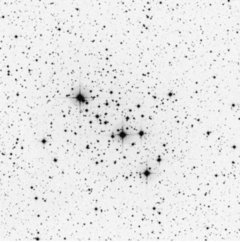 So to reach my final Trumpler classification for M103 I threaded these components together estimating M103 to be a II2p open cluster of about 10 arcminutes angular diameter. How does this compare with the official data? 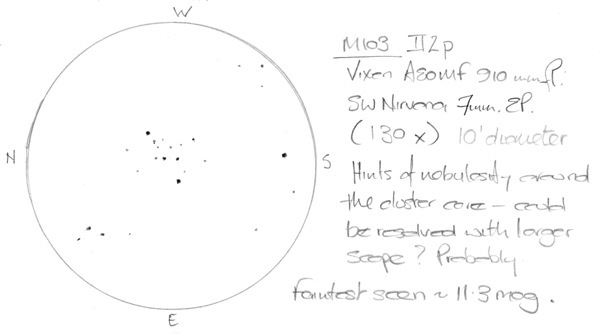 My estimate of the angular diameter is a little above the 6 arcminutes in the literature which also thinks that M103 is a bit richer giving it a rating of m rather than p.
I can live with that comparing my sketch with the DSS image.